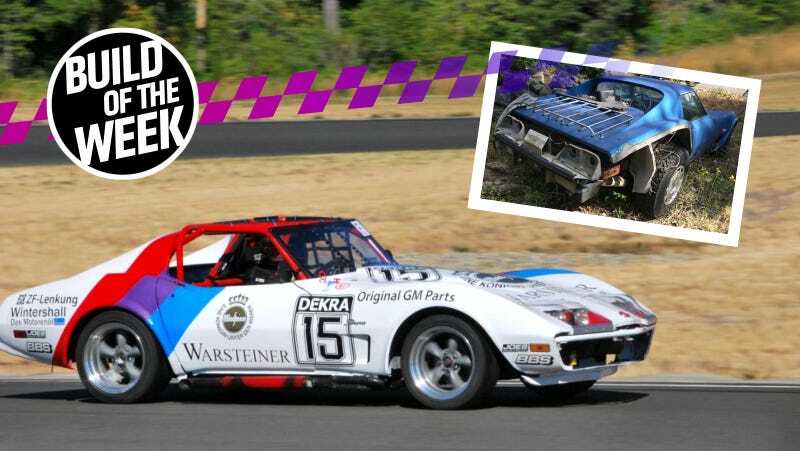 “What in the hell?” That was 24 Hours of Lemons race organizer and ex-Corvette Magazine writer Nick Pon’s reaction after the series’ first C3-generation Corvette popped its freshly repainted, Warsteiner-liveried hood. Inside was the BMW M50B25 inline-six engine out of an E34 BMW 5 Series. Surprise! Fitting the BMW engine inside. Lemons, of course, is the jokey endurance racing series for cars that adhere to a $500 budget. The more sacrilegious or unfit for racing your car is, the more likely you are to get one of Lemons’ higher awards, like Index of Effluency or Organizers’ Choice. The funniest part of all is, an inline-six Corvette really isn’t as out there of an idea as you might think. The very first Corvettes were powered by an inline-six. Amid slow sales and sagging performance, Chevrolet dropped the six in favor of V8s that could make adequate power, but BMW had raised the inline-six to an art form by the time the E34 came out. Problem solved! Best of all, the BMW M50 fits inside the C3 Corvette’s engine bay with hilariously minimal mods. 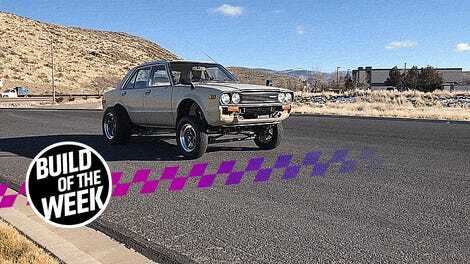 In fact, most of the modifications to this car involved bringing it back down to earth after its previous owner lifted it and put it on truck tires, building a surprisingly tricky roll cage and strengthening the chassis for race duty. Brooks’ Low Road Racing team wasn’t new to Lemons racing—in fact, they previously ran a Rainier-liveried Ford Mustang II and an Old Milwaukee-liveried Pontiac Sunbird in the series. Brooks’ Corvette was a project car that had been pushed farther and farther from a couple’s home over the course of 15 years, out of sight and out of mind. The home itself was way out in the woods of Western Washington, where the car developed the fine layer of green inside that coats every possible surface that’s left alone for too long in the Pacific North-wet. The husband who owned the Corvette had always intended to start restoring it, but never got around to it before he and his wife decided to get a divorce. To sell their house, this unloved monster-truckified Corvette had to go. The problems with Brooks’ new Corvette were many: the floor was toast. One whole quarter panel was missing entirely and the other one had been cut out to make room for huge truck tires. The truckification didn’t end there. The rear shocks were also truck shocks, which were 24 inches but had collapsed into a stiff, unmovable mess over the years. Fortunately, it at least came with a set of spare quarter panels. Then there was a problem with the engine: it didn’t work. It briefly smoked like a chimney before it “went boom.” The transmission was also shot. The team wanted the first C3 in Lemons, but the heart of the C3 was no more. At this point, it was around one o’clock in the morning, and the team was sitting around Brooks’ garage. Because it was going to be a Lemons car, they gave up on making it work for a bit to discuss what clever theme the car would have. “We’re not going to get away with another tribute car, replica or something like that,” Brooks explained. But they did figure they could put a completely unrelated classic livery on for the laughs. “What if we did any other really well known paint job that totally has no place on a Corvette just to be obtuse?” Brooks asked. The car the Corvette modeled itself after. The E30 DTM car even had Warsteiner as their main sponsor, which made it it with Long Road Racing’s previous efforts. But they still had to make it fit somehow. “If we did that, it would have to be BMW-powered,” Brooks said. So, he whipped out a measuring tape and started poking around his E36's engine bay. Sure enough, the dimensions were such that a BMW inline six would just fit in the Corvette’s long nose. “It clears everything by about half an inch, and it would look brilliant in that long, skinny hood,” Brooks continued. At this point, at 1:30 a.m. with a little bit of a buzz, the decision was made: they needed a BMW drivetrain. A wild E34 drivetrain appears. By 9 a.m. the next day, Brooks already found a suitable donor E34-generation 1995 BMW 525i with a manual for $300 on Craigslist. It was a high school kid’s car, so it had a dented quarter panel, which Brooks didn’t care about. As soon as it fired up, he was sold on it, much to the seller’s surprise. “I’m not going to tell you what I’m going to do with this car, but sold,” Brooks told the kid. Rebuilding the original small block Chevy motor to run reliably would have been prohibitively expensive. Paying $300 for an entire BMW drivetrain to stick into a free Corvette was right in budget. Test fit of the engine in the frame. Fitting the engine in the front was the simplest part. Almost everything fit right in, with the notable exception of the alternator, which was replaced with an alternator from a Kubota tractor in order to make it fit. The team made a bracket for the new alternator, and it fit right in place. The E34 oil pan had been swapped with an E36 oil pan to help out someone looking to do an engine swap in an E30, too. The driveshaft was a little trickier to make fit, but not terrible given the extensive work they had to do to the rest of the car. To make it work, he had to connect the BMW rubber drive shaft coupler to an actual driveshaft. This forced him to machine a yoke flange to make connect properly, and then build a driveshaft that ultimately ended up being part-Corvette, part-Ford truck driveshaft. Everything around the drivetrain was much tougher. Building a roll cage to Lemons’ safety specifications in a fiberglass-bodied C3 Corvette took a lot of emails back and forth to the Lemons staff. Any time you have to go outside of their usual specs, it requires a pre-approval from the series to make sure it’s all safe. Quite possibly one of the sketchiest ways I’ve seen a car frame lifted up in a long time, but this is what they did to access some hard to reach items on the C3 frame. We might recommend borrowing a nice lift instead. The body had to come off of the frame to get started on the roll cage, where it took up one garage stall as someone sanded away on it and got it back to looking like a Corvette. The construction of the roll cage was another issue. The C3's frame goes up at an almost 90-degree angle behind the driver’s seat, so the door bars for Brooks’ roll cage had to be attached to the frame instead of the main roll hoop where they usually do. The main roll hoop for the cage behind the driver was welded into that higher rear part of the frame as well, positioned as if the part of the frame where the door bars welded into was just the lower part of the roll hoop. Because the car had been sitting so long, he also encountered some flammable presents left in the frame from the local wildlife while he was welding it all together. Brooks wanted to make sure he was doing it right, so he even went to look at some locally owned ex-Greenwood C3 Corvette race cars not just for inspiration, but to study how the roll cage actually fit on the car. After proving to the Lemons staff that his roll cage work was fine, they agreed to let him chop off the C3's roof. Because they had to build a new floor anyway, the floor was ultimately moved down about an inch and a half to accommodate slightly taller drivers. It’s still a tight fit, though, as Brooks says there’s a firm driver height limit of 5'9" before helmets start to pop over the roll cage in an unsafe way. Tubing was added under the subfloor to connect the frame rails and strengthen the car, and the engine mounts and transmission crossmember were modified for the BMW drivetrain. Floor modifications, before the roll cage went in. One brand new tractor alternator. Fancy NASCAR calipers, purchased used. Most of the items that cost actual money, like wheels and tires, are exempt from Lemons’ $500 budget because they’re regarded as safety items. Some bits, like the driver’s seat and a pair of $100 ex-NASCAR Wilwood brake calipers, were purchased used. “People don’t realize how cheap Corvettes are,” he continued. Even the donor BMW had enough things sold off of it to negate the $300 spent buying it. The one thing Brooks said his team really spent actual money on was a set of clear Le Mans-style headlight covers—which were aesthetic, but had to happen. The team retrofit the 5 Series’ headlamps underneath those covers as yet another nod to its Bavarian innards. Back together after the cage build. Perhaps the worst part about a new Lemons build is that there’s rarely enough time. There’s usually something you forgot, or didn’t quite check. In this case, it was first and second gear, which the E34's transmission was missing. Because they discovered this problem right before the race started, Brooks’ own track E36 had to be sacrificed to make the Corvette work. They were already starting to paint the car—right down to making the Corvette emblem’s checkered flag into a blue and white Bavarian one—and noticed that two whole gears weren’t working. Now that’s attention to detail. Raiding the E36 track car for a transmission at the last minute. “With like two days to go before the race—and the car hasn’t moved under its own power at all—I had one friend under the Corvette pulling the gearbox while my wife was under my E36 pulling the gearbox, while I was finishing stuff in the engine bay. We tore the gearbox out of my E36 track car and shoved it into the Corvette—as an emergency, it has to roll kind of thing,” Brooks explained. It’s always good to have an extra car similar to the one you’re racing on hand, but the problem is, the E36 never got its transmission back. It sat on jack stands from mid-August of last year until he eventually also took the engine out. He sold the E36's shell just three weeks ago. “A five-year project pristine, fully-built E36 track car eventually ended up dying just to provide the gearbox for the Corvette,” Brooks noted. Ouch. But he figured he’d never go back to his E36 after building the race car, so the BMW went away. As for the car, Brooks said he built the exhaust Thursday, and loaded it up Friday, after it had only done a single lap around the block. Their work wasn’t done at the race, either. They got enough done to get it to pass tech inspection for the race—even putting the roll cage padding on in line for said inspection—and then rolled on through. Lemons inspection, complete with Warsteiner bribe. After that, all of the minor items that were left to get it running got wrapped up before the race began, although notably, it’s still missing gauges. That’s on the to-do list, eventually. It was a 98-degree weekend at The Ridge Motorsports Park, and the car didn’t have power steering or any kind of driver cooling installed. The hydraulic power steering systems on C3s tend to fail abruptly and jerk the car’s steering rack all the way to one side when a vital actuation switch fails, so the team disconnected the pump entirely, leaving it extremely heavy to muscle around. Otherwise, the car was pretty fast, but still balanced and forgiving to drive. In other words, the C3 Corvette’s fast looks finally match its performance. It was also fairly reliable. The downpipe broke and had to be welded back together, and a wire going to a crucial arduino on the dashboard wires broke on Saturday morning of the two-day race. That arduino tells the BMW ECU that the car is moving now that it’s no longer housed within a BMW, so it had to be mended on the go. The engine limits itself to 5,000 RPM if it thinks the car is stationary in order to avoid failure. Brooks, whose day job is working as a game developer for Forza, clearly didn’t have time to work on virtual cars and throw a real car together all by himself. He credits a host of characters with helping him get the BMW-vette ready, including his wife Leslie and friend Matt Laverty, who were there almost every night of the build. Bonnie Rodgers did the excellent decal work for the car, and Nathan Retchless also put in a solid week of work on it. Last-minute to-do list from the night before they left for the race. There’s still a bit of work left to be done, of course. Installing gauges and tweaking the exhaust are on the list, as well as the addition of an electric steering rack from a Prius, of all things. While the Prius’ electric power steering system isn’t an enthusiast favorite, it was only $25 at the junkyard and fits perfectly in the tight C3 engine bay. To remedy the common complaint that Prius steering is too numb, Brooks plans to build a signal generator to allow the driver to adjust the amount of feedback with a knob. The Prius rack adjusts its response based on the speed of the car, so Brooks plans to add an arduino that fakes the car’s speed based on the knob position to the power steering system. Even though it’s a lot of work, it’s definitely been a ton of fun to put together. Brooks expects to get more drivers to sign up beforehand now that his sacrilegious swap made it through one race, too, so no worries. Considering that most of the hard work was to repair rotten parts of the car and prep it for racing, we’re kind of stumped why BMW I6s don’t end up in C3 Corvettes. It fits too neatly, and brings America’s most famous sports car back to its roots in a weird, roundabout way.